You’ve seen the hype on social media, but what is it all about? I myself am even guilty of posting some really succulent looking weather data, but not really giving it any context as to why the threat is conditional… All the impressive ingredients really mean nothing, if no storms are able to form! Monday is one of those days, where extreme ingredients combine to make big bright red colors on all the forecast weather maps go nuts. 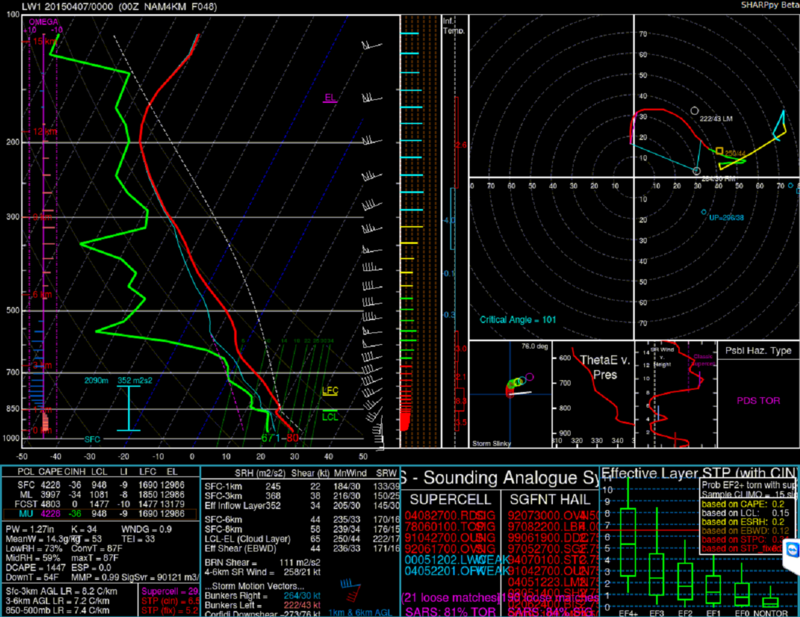 A lot of “soundings” are going around, which give forecast vertical profiles of the atmosphere at a single point, that look really impressive, yet models, at least short term convection models, do not have a thunderstorm developing. Let’s take a look at some of this in detail! A broad west coast trough will setup southwesterly flow across the southern plains next week. There will be a few waves during this time period, but the main idea is multiple days of severe weather, with a dryline setup over the southern plains. The first day up to bat, is Monday. Monday features relatively strong flow, plentiful moisture, ample instability, but, the lack of any appreciable forcing, may ultimately limit storm development. With warm air aloft, continued lift is needed for storms to develop. Often, a powerful shortwave or favorable jet dynamics can aid in vertical moistening and cooling of the profile, lessening inhibition. With Monday, however, we do not have a strong shortwave. The dryline circulation will be present, but it may not be “deep enough” (in the vertical) to bring storms to their LFC, or level of free convection. If we analyze the sounding below, we see by just looking at a few things that there are some impressive things here. 1) Impressive wind shear. 40+ kt 0-6 shear supports supercell storms, and low level wind shear/srh supports tornadic supercells with 0-1 SRH well over 200. 2) Impressive instability, with CAPE values over 4000 J/kg. 3) Impressive composite parameters, which are a combination of the above two factors. 1) Winds veer rather quickly in the lowest 2km.. This can force parcels to get shunted well east of the dryline and out of the actual lift associated with the dryline circulation. 2) There is still a hint of warm air aloft. Through the day, this profile has been cooled and moistened, but there is still a hint of warm air. 3) The dryline circulation usually peaks at the top of the moist layer, which we can see is about 850mb… The issue here, is that the LFC is at at about 775mb.. That means a parcel may never get to its LFC, or the point where it can rise freely though the atmosphere. You can see the “convective temperature” or the point where a parcel could rise freely from the surface is 88F, while the surface temperature is only 80F.. That’s an issue! So, how do we get a storm? In this environment, any convection is going to rely on either deeper moisture, or, more likely, a rogue wave to eject out, that hasn’t yet been found by the models. Why does a wave help me? A shortwave can do two things that help storm initiation in cases like this (dryline). 1) A shortwave will provide ascent which can cool and moisten profiles from the bottom up.. Like mentioned above, this can weaken inhibition and lead to a greater potential for storms. 2) A shortwave also usually has a local effect on the winds, tending to back them (turn them from southwest to south or southeast, basically counter clockwise). This, can cause a parcel to not be shunted east of the dryline and stay in the circulation, making it more likely it will reach its LFC. Yep most of them! The NAM4 is completely dry, while the SREF apparently has a few members that try to initiate convection, since the significant tornado ingredients parameter seen below, requires some precipitation falling in order to be triggered. Stay tuned! If storms are able to fire, they will definitely have the potential to be severe! Listen to your local NWS offices and SPC for more information. If you enjoy technical weather discussions, checkout the Stormtrack thread about this!